Slaughterhouse Five was one of my favorite books when I was younger – and it probably deserves a re-read now – and I was always struck by the idea of being able to live and relive the moments of one’s life at all moments of one’s life as the Tralfamadorians do, seeing life across four dimensions rather than three. I am starting to think we all have become unstuck in time. 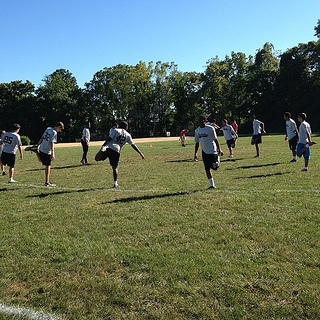 The other day, I posted a photo of the SLA Ultimate Frisbee team warming up before our first game of the year. Within an hour or two, there were “likes” and comments from former players, folks I used to coach against, former students and, of course, members of the current SLA community. What is incredible about that is that it connects the generations of my coaching and teaching life in some really amazing ways. The teaching life is a strange one… as educators, we have these incredibly powerful relationships with kids at a moment in time in their lives and then they go on their way… and we do that over and over again. And over time – at least for me – it becomes harder to remember who overlapped with whom in the time they spent with you, especially because the time line is less important than the time spent. And now, with Facebook, the teaching life overlaps more. Former students interact with current students with comments on photos like, “I remember 6:30 am…” and such. My teaching life has become unstuck in time, and all of the students of my life can interact regardless of the moment in time we were teacher and student. What a wonderful evolution of the teaching life. Really appreciate all of your posts Chris. I did a lot of head nodding on this one. I have loved all of the present moments that I have with kids. The more time we spend in this amazing profession, the more overlap that occurs. Working and living in the same community where my kids all go to school increases the interconnectedness of life and work and play. It is all awesome. Thanks again.